One darling 14 Karat yellow gold heart is showcased in an outline of Pave Diamonds that extend down the split shank, a truly romantic piece. 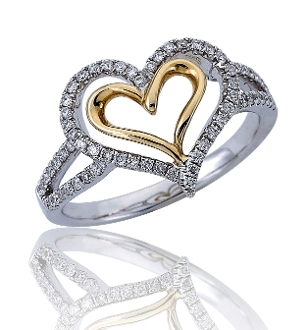 Dazzling Pave Diamonds grace the outer heart and split shank. Set in approximately 2.9 grams of solid 14 Karat gold, this 0.28 Carat t.w. brilliant round-cut Diamond fine jewelry ring makes a stylish and thoughtful accessory! For added appeal personalize your item, select our Engrave option when indicating size needed while adding to Cart.